On October 15, 1908, an Irish clerk and ex-soldier named Wallace Brandford Collins ordered a throng of unemployed men and women in Hyde Park to riot at the British Museum. Collins was described as a man of powerful physique who wore a dirty red rag and a war ribbon in his buttonhole. He exhorted the crowd, estimated by the police at four or five hundred people, to raid the public collections at Bloomsbury: “If you chaps go into the British Museum and see any art-pictures there, and it is not yours, well, you take it. It is worth taking it. If the police interfere with you, smash the frame on his head. It ought to be yours. We made all the art in this country. If you go to the British Museum, take all that is in it.” After this rousing speech, Collins gathered his followers at Marble Arch and set out to storm the British Museum. 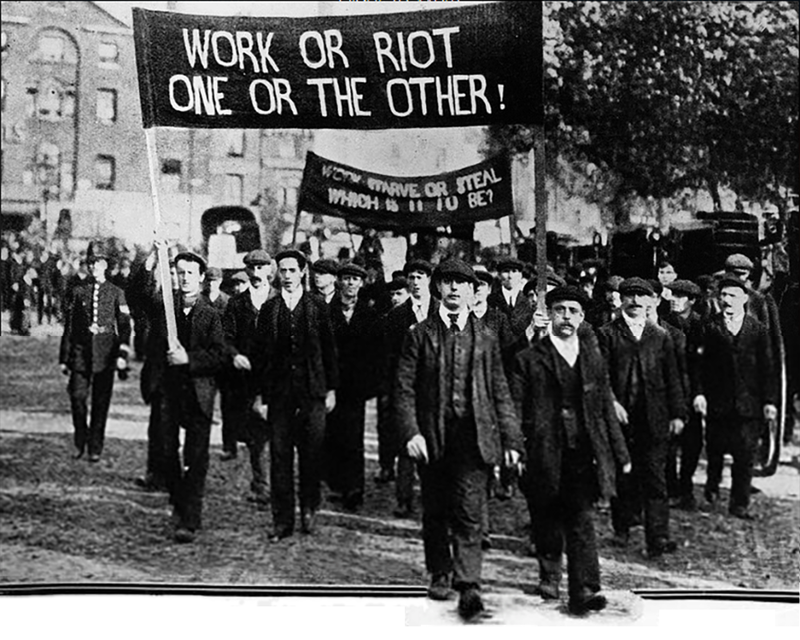 One hundred men followed him through the streets of London, waving their “Work or Riot!” banners high. The crowd was halted en route to Bloomsbury by a police inspector, who warned the marchers that the museum’s iron gates would be closed against them. Collins bid the protestors to join him the next day at the House of Commons with bricks, iron bars, razors, and homemade bombs. He was promptly arrested for using language calculated to cause a breach of the peace and inciting the public to acts of violence. The Collins trial was a raucous affair, brought to a speedy conclusion by the defendant’s own disruptive behavior. Collins shouted down the chief police witness’s testimony, declaring that he would smash any work of art in his possession over the inspector’s head. In the end, Collins was sentenced to three months in Pentonville, the infamously harsh model prison in north London where Oscar Wilde had been incarcerated ten years earlier.’ There was great difficulty in getting Collins to leave the courtroom; he refused to make his exit until he had addressed the judge directly, declaring himself a martyr and a hero for world emancipation. This entry was posted in Uncategorized and tagged 1900's, 20th Century, Art, Great Britain, Labor, London, Museums, Poverty, Rebellion, Riots, Wallace Brandford Collins. Bookmark the permalink.